We at SayItSocial take great pride in the fact that we are a certified Google Partner. As a Google Partner, we are privy to the latest developments in the world of digital advertising (not to mention, we’ll be on Google’s good side when they inevitably decide to take over the world). We also get to host exclusive Google Partners Connect events – like we did on October 15th at our new headquarters in TekMountain. 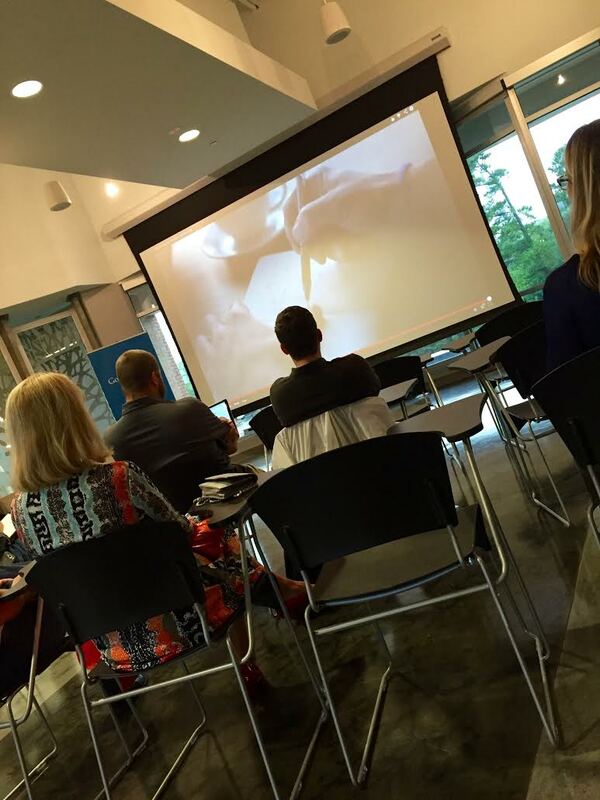 Using an ultra-modern big screen projector in TekMountain’s Reef room, we along with a party of Wilmington professionals watched the #PartnersConnect live stream panel on growing small to medium sized businesses with AdWords. Allan Thygesen kicked off the event by showcasing a realistic need state situation in which a consumer uses smartphone voice control to find the locations of the nearest pharmacies. Thygesen illustrated how businesses can work to ensure that they are listed prominently in Google search results for location-based queries using a variety of free Google tools. He then proceeded to highlight the effectiveness these tools – citing the impressive statistic that 5 million businesses have “gone Google” and have utilized these tools to successfully grow their businesses. An interview with Roberto Gil – the founder of a children’s furniture design and manufacturing firm called Casa Kids – provided a testament to the effectiveness of AdWords for small business growth (Casa Kids enjoyed a 30% increase in sales within the first few months of running AdWords campaigns). After Thygesen came the Evangelist – Frederick Vallaeys – who broke his presentation down into 3 modules. Vallaeys began with a review of Google’s current Search Results Page – highlighting features such as the paid ad atop the page, the Google map in the top right corner, organic results, google+ business overview and contact info. Afterwards, Vallaeys noted an important observation: the Number 1 organic search result is displayed on the bottom of the results page, but the 2nd and 3rd organic results are not immediately visible- implying that optimizing paid search campaigns may have larger returns on investment than organic SEO. The AdWords Evangelist then dove into an overview of what it means to “Google Your Business”– elaborating on how claiming ownership of your business online and populating Google+ is essential to help customers find your shop. Beyond the obvious contact info, hours of operation, product/brand info etc., Vallaeys encouraged businesses to add content that communicates both commitment to customers and industry expertise. One of the most exciting segments of the Vallaeys presentation had to be his overview of “new” AdWords Extension technologies. These extensions empower businesses to create automatically updated advertisements that use real time data to ensure that ad copy is more relevant than ever before. Using real time data from information regarding weather, inventory, sale length, wait time, the stock market, and more, this new technology promises to raise the bar of targeted ad accuracy. Vallaeys also added that utilizing ad extensions often leads to a 20% lift in click through rates! After providing some real-world examples of how the capabilities of ad extensions capabilities benefit businesses, Vallaeys gave a basic overview of Google’s retargeting capabilities – emphasizing effectiveness and importance of remarketing online as 64% of all shopping carts are abandoned. “More people own smartphones then a toothbrush”, said Vallaeys in with a tone of simultaneous fear and awe as he began his presentation on the importance of mobile marketing. Current trends show that mobile usage will surpass desktop in the near future, and Vallaeys provided an ample amount of success stories about businesses that were able to achieve significant revenue growth through optimizing their mobile user experiences. 1. Make sure that your business’s mobile website is not cluttered and contains a limited amount of information so that potential customers aren’t frustrated by accidentally clicking on something undesired. 2. Businesses can create either Anchor Style Ads or Magazine Style Ads for free using prebuilt templates on Google Web Designer. Viewers were also reminded that Google can track the relevant keywords and resulting phone calls from mobile devices using AdWords. The concluding segment of the #PartnersConnect event centered on how Google is perpetually improving is ability to track customer behavior. While customer’s purchase pathways on individual devices can currently be analyzed through Google Analytics, Vallaeys mentioned that google is developing methods for cross-device tracking – i.e. tracking a single consumer’s purchase behaviors across smartphones, tablets, desktops, and brick and mortar retailers. Exciting Stuff! We will continue to monitor how technologies evolve and keep an eye out for brands that utilize them for widespread success in digital advertising – until then, we are all looking forward to the next Google Partners Connect event. Ian Out!